Veteran Republicans of course, are persuaded that Elena Kagan will win easy confirmation to the Supreme Court. That may or may not be the case, but the problem is that veteran Republicans, soaked in generations of political convention, are all wet. It is unfortunate that most or all of Senate Republicans are also soaked in generations of conventional wisdom. Conventional wisdom long ago abandoned a standard of constitutionality, conceding in the environment of mass-media and education-promulgated unconstitutional pandering, that constitutional fastidiousness was a political loser. And maybe, certainly in some cases, it was. And the argument will be often made that it is better for Republicans to be elected than not, even if it involves some compromise. And I concede that it is not always even compromise. I could list many notable and intelligent conservatives who are adequately marinated in a contemporary culture that, though they incline to see government interventions into private commerce as generally detrimental, will allow that in certain “emergencies” it is necessary. These are people whose intelligence and knowledge I respect and/or whose writing and speaking I enjoy. But I, a nobody in terms of popular acclaim, disagree. I think The Constitution is not only the fundamental law in this country, it is an inspired law: it reflects truth. I can’t unquestionably say why, but to some of us, there is an insistent whisper from somewhere (God?) that says a principle is a principle. The truth is not an equal opinion, and has unique value and unique persuasive power. It is not incidental. What is wrong at one time is wrong at another. And, that is not only a moral statement. In the big picture, what is right is also most auspicious. An immediate example is with things like TARP, which many conservatives supported. And only in the past few days, very celebrated and thoughtful conservatives have conceded that the “loan” that the euro zone countries and International Monetary Fund will make to Greece, is necessary. Of the $145 billion dollar loan, the euro zone countries will provide over two-thirds. As the largest participant in the IMF, the U.S. will be responsible for over $7 billion of its $39 billion contribution. The White House approves the plan, by the way. Now, there’s a shock. I even grant that failure of government to act may well result in a more dramatic and painful decline in these cases. And, I know that politicians find such conditions politically untenable. But a market left free and uncorrupted will also see a quicker and steeper recovery. And, it is government corruption of commerce and markets that causes problems like both our 2008 problems and those now consuming Greece. Barack Obama ceaselessly talks and probably will endlessly, of having saved us from total collapse with his recovery plan. First of all the “stimulus” plan was a joke, more political payoff than stimulus. But TARP likely palliated the drop. But without it, and certainly without the stimulus and automobile company usurpations, we would now be farther along in a stronger recovery. I put “loan” in quotation marks because the assumption of Greece’s recovery and repayment assumes Greece’s implementation of austerity measures and improvement to its debt to GDP ratio. Will that happen? Greece’s violence and demonstrations are largely the result of its attempts to moderate its extravagant benefits. Good luck on that. It isn’t like the banks paying back their loans, whose history and existence is in being profitable. The Wall Street Journal had an article on the Greek Bailout, today. Here’s what struck me as a sentence of interest: "'If the Greek authorities can end with an economy that's much more efficient,' Mr. Lipsky (IMF official) said, 'the debt-to-GDP ratio will start to recede,' and Greece will be able to borrow from financial markets and pay its bills." The interesting words are at the beginning and the end. “IF” Somehow, I suspect that the dice at a Craps table are a better gamble. And, “Greece will be able to borrow from financial markets and pay its bills.” No one even blinks anymore, at the idea of borrowing to pay your debts. It’s standard operating procedure that we do every day. America services debt by borrowing more money and pays for maturing bonds by selling more bonds. That reminds me of a discussion I saw the other day when observers said that countries are learning that you can’t keep spending more money than you bring in. Shouldn’t parents have taught us that at age 4 or 5? Getting back to the Kagan nomination for The Supreme Court, the US is also entering an impossible financial situation. Our debt is impossible to resolve in our or our children’s lifetime, or any lifetime short of drastic changes, even if economic growth rates are very healthy, which there is no reason to expect any time soon. We are finally entering the period when SS and Medicare entitlement liabilities will rapidly outpace revenues. And, we are adding monetary profligacy and weakness and probable severe inflation to the impossible situation. The past century’s trifling with The Constitution is a game we can no longer afford and never should have engaged in. And if we can summon the legislative resolve to make the necessary dramatic changes, we certainly don’t need judges who shamelessly define those changes as “unconstitutional,” rewriting the meaning of The Constitution for their favored causes. I don’t care if she has no judicial experience. And I’m glad she’s considered genuine and friendly. But, even if she’s Little Bo Peep, she’s a Constitution-corrupting liberal. That rules her out, and conventional wisdom can take a hike. This is why I am referring to the Kagan nomination as a test of Republican radar. If there was a time when Republicans dithered on constitutional principle, right now is the best time to seize an opportunity to stand on that principle. A dumb animal will continue its habitual behavior even when the conditions of its environment has changed. Having won election by swaying a healthy plurality of Independent voters, in one year, the actions of Obama and Democrats in Congress have dramatically reversed that, losing statewide races in 3 states that Obama won in 2008. They lost the governorship of previously purple-trending Virginia. They lost the governorship in what had become solidly blue New Jersey. And in one of the bluest states in the country, they lost TED KENNEDY SENATE SEAT IN MASSACHUSETTS! So alarmed are a previously slumbering electorate, that there is a move to studying the proper constraints of The Constitution like I have never seen in my lifetime. Conservatives are rejecting moderate incumbents in favor of more principled conservatives. If ever there was a time to stand on constitutional principle, it is now. If ever there was a time to defy the sort of conventional wisdom that assumes an unapologetic liberal president’s nominee of an unapologetic liberal judge for The Supreme Court, it is now! Does Republican radar sense the dramatic change in the electoral environment? Or will they, like the dumb animal, carry on with their same old habits? Standing on principle now is it? "right now is the best time to seize an opportunity to stand on that principle." Oh, you like pandering to La Raza to get the Latino vote? 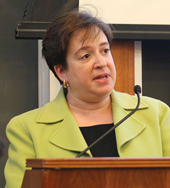 Elena Kagan (make that Supreme Court Justice Elena Kagan) will be confirmed in a cakewalk. Mitch McConnell will do nothing substantive, since he has no trump card to play.